Ghosn with his new deputy Bollore, right. PARIS -- Renault's board proposed the renewal of Carlos Ghosn's CEO position for another four years and appointed Thierry Bollore as chief operating officer. Ghosn, 63, should "take decisive steps to make the alliance irreversible" during his next term, to be proposed to shareholders at their annual meeting on June 15, the company said in a statement summarizing board resolutions. France, which owns 15 percent of Renault and backed the resolutions, has been pressing for a deeper tie-up with Nissan to ensure the carmakers' 19-year-old alliance can survive the eventual departure of Ghosn, its main architect. The appointments put to rest weeks of speculation about Renault’s future leadership and ensure Ghosn will continue to shape the company through a jarring technology transition. The promotion puts Bollore, 54, in line to succeed Ghosn at the top job. 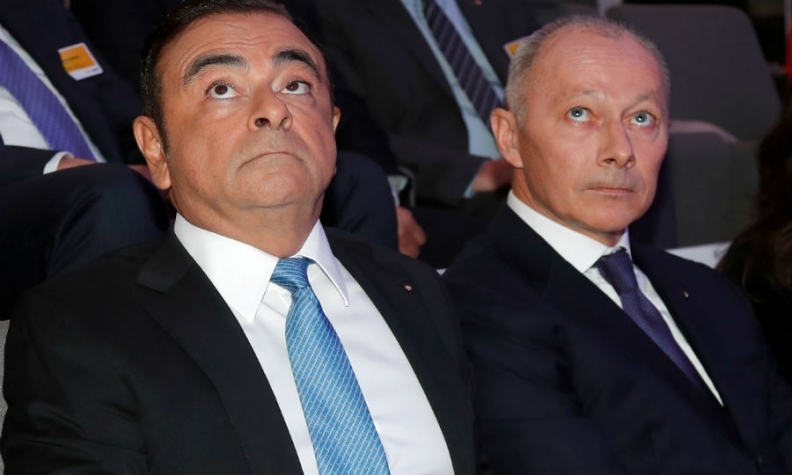 Ghosn had earlier been expected to hand over the reins to a new CEO and move to a non-executive chairman role overseeing the Renault-Nissan-Mitsubishi alliance. But the plan foundered on differences with the French state over the alliance's future shape and direction, sources have said. Ghosn saved Nissan from near-collapse almost two decades ago and spearheaded the globalization drive that now unites automakers from across continents. He remains chairman there and at Mitsubishi. He has been Renault CEO since 2005 and chairman since 2009. The uncertainty about Ghosn’s role has served to highlight tension within Renault’s management and questions about its longer-term leadership. Earlier this week, France signaled that it would support a renewed mandate for Ghosn if he was given a No. 2. The government backed the nomination of Bollore, a French citizen who started his career with tiremaker Michelin, like Ghosn. Bollore joined Renault in 2012 from French supplier Faurecia. The new structure could give the French government political cover to reduce its stake, ultimately making a full merger of Renault and Nissan “a very real possibility,” Ellinghorst said. Ghosn said a year ago there would be no merger between Renault and Nissan as long as the French government is a shareholder. France raised its stake in 2015, under President Emmanuel Macron, who was economy minister at the time. The state has no plan to sell Renault shares, the government official said. Renault currently holds 43.4 percent of Nissan, which in turn controls Mitsubishi Motors via a 34 percent stake. The French government wants Ghosn to prepare a road map by June on how to better integrate an alliance with longtime partner Nissan as well as coming up with a progressive succession plan.